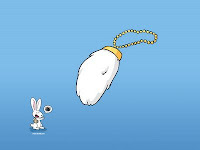 I never understood how a rabbit's foot meant good luck as it wasn't very lucky for the rabbit. I have a comparison along the same train of thought. I recently posted about my dog's wild behavior. Yesterday I went online and found a e-book I could print that had invaluable information. Some of it I've already implemented and can see measurable improvement. Ways to become the *drum roll* Alpha Leader! There were many more ways that I don't have the time to talk about, but one of them was to always eat first and the dog second. That's how dogs do it in the wild. The Alpha leader always goes first. We always eat at our computers or at the coffee table. (Oh c'mon.. you've done it too!) Last night we (I) decided for this new method to be effective we should eat at the dining room table aka the place I fold clothes. Hubby had already glanced at part I'd printed as I pushed it under his nose showed him when he got home from work. He knew what was coming and I'm surprised he didn't run for the hills..
Yep. He was lucky enough to sit with me and listen to my endless, uninterpreted rambling. I've been known to talk the ears off everyone, soliciting many STFU looks over the years. So.. Lucky rabbit? Lucky Hubby? Well I look at it this way. You are trying to control your weight...one of the best things they say to do that is to make sure you sit down "at the table" to have your meals or any food....that in itself helps limit the number of times you make the trip to the kitchen. I was raised at sitting down for dinner,and I passed that on to my children. Dinner was a time for the family to gather and share their day. I valued those times...with it just being hubby and I we don't use the kitchen table very much anymore unless the family is visiting....sadly our dinners are spent eating in the livingroom....I don't like it....he turns on the TV and we watch the news or something...which then doesn't leave us time for chatting....not making excuses but I think that started because he was spending a lot of evening eating by himself as I often was not home for dinner due to my work schedule. Anyhow...I think it's wonderful to sit down and have dinner together...so yes lucky hubby! I made it all the way through 3 whole minutes on the way to work yesterday w/out speaking. It's a 20 minute drive. Hey, they married us, they have to listen to our uninterrupted chatter!